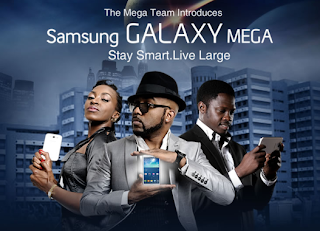 Welcome to awesomegist for the best entertainment, science news: Samsung Drops the Galaxy Mega... just for you! Samsung Drops the Galaxy Mega... just for you! The mystery surrounding the #MissionMega that has been all over social media; with intense buzz on Facebook and trending on Twitter on July 1st has finally been unveiled. Apart from unveiling the phone, Samsung also rewarded peeps that took part in the competition with Galaxy Mega devices… amazing right? So guys, if you’re looking for a fun gadget that multi-tasks on the latest Android Operating System, has a Dual Sim and doubles as a Smart Phone and a Tablet… then the Samsung Galaxy Mega is just right for you.